I would have LOVED to take advantage of this but the stores in my area are already booked solid! Sooo, I wanted to share with all of you so you can hurry and register your child. 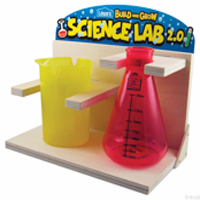 This looks super cool and if you have a little scientist in your home, they should have fun! Registration is now open for the FREE Science Lab Clinic For Kids at Lowes on Saturday, November 8th! Your kid will love this kit! Each kit comes with experiment cards so they can continue the fun at home! Build and Grow Clinics are free to the public and occur every other Saturday at 10am. Note: Spots do fill up quickly.